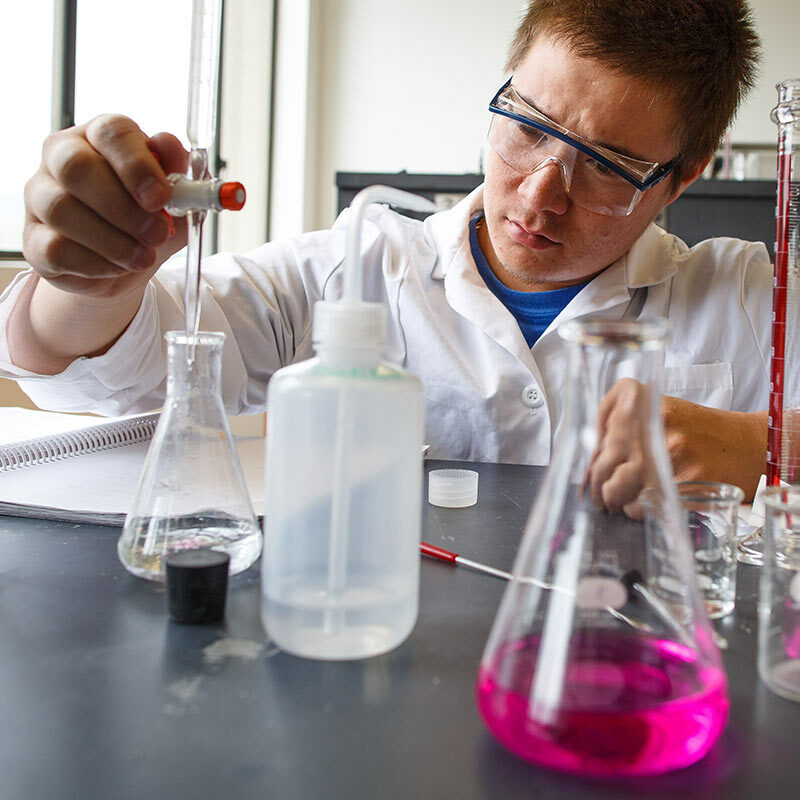 A Chemistry or Biochemistry degree from SOU puts students on the fast track to entering graduate research programs, professional programs in healthcare, business, communication, law or policy, or exciting careers in one of many chemically-related disciplines. Students majoring in chemistry typically enter positions in private, academic, or government laboratories, or they enroll in graduate or professional schools. There are outstanding opportunities for graduate study in chemistry. A bachelor’s degree in chemistry provides excellent preparation for graduate study in a number of other fields, including business, dentistry, engineering, environmental studies, forensic science, law, medical technology, medicine, oceanography, pharmacology, teaching, and veterinary medicine. The Committee on Professional Training of the American Chemical Society (ACS) has approved the chemistry program’s curricular offerings, faculty, and facilities. Students who complete the approved program are certified by the American Chemical Society and become eligible for full membership in the society upon graduation. The ACS certified degree options are strongly encouraged for students planning to attend graduate school or seeking employment in industrial or research positions. The degree option in forensic chemistry is designed on the recommendations of the National Institute of Justice and is excellent preparation for students seeking employment as a forensic laboratory technician. The bachelor of arts in chemistry is specifically designed for students with career aspirations related to health care, including medicine, dentistry, pharmacy, physician’s assistant, and veterinary medicine. The required courses are based on the recommendations of the Association of American Medical Colleges and the top healthcare graduate programs in the United States. All chemistry majors are required to complete a capstone project. Depending on whether students are pursuing a BA or BS, capstone projects may be either lab-based or literature-based. BS Chemistry students base their capstone on original, lab-based research with a faculty advisor. BA Chemistry students capstone projects are comprised of a literature review of a chemistry-related topic of interest. By the third year, all chemistry majors enroll in a course sequence of chemical communications in preparation to conduct their capstone research project. Throughout the course sequence, students learn how to retrieve, organize, and cite chemical information. Students ultimately prepare a review paper, research proposal, and oral presentation relating to their capstone research project. This program is designed for students preparing to enter careers in chemical research, industry, medicine, or any field that requires strong analytical skills, math skills, and scientific literacy. Students preparing for advanced study at the master’s or doctoral level are advised to pursue a Bachelor of Science certified by the American Chemical Society (ACS) which offers the most thorough preparation in all areas of chemistry, physics, biology, and mathematics. Students establish a core foundation by completing our general chemistry sequence with corresponding labs. Students will then deepen their understanding of chemistry by enrolling in organic chemistry and physics. By their third year, chemistry majors begin taking advanced courses in the remaining disciplines of chemistry: analytical, physical, inorganic, and biochemistry. Further courses provide advanced training in specific areas of instrumentation, computation and scientific communication. Capstone projects in chemistry are meant to provide a comprehensive, lab-based experience in which students draw upon and apply their education. In essence, students and professors work together during capstone to discover new knowledge. It can be one of the most rewarding aspects of the Chemistry degree. Under the guidance of a faculty advisor, students learn to independently design their own experiments, analyze their data, and interpret their results when the outcome is not already known. Skills and techniques are developed by extensive hands-on use of research-quality instrumentation. At regular intervals throughout capstone, students present their progress to their peers. Capstone culminates with a final presentation to the chemistry department, as well as a poster presentation at SOAR. Chemistry degree holders are valued for having excellent analytical and mathematical skills. While many undergraduates pursue chemistry as a step towards obtaining professional degrees (such as medical school, veterinary school, and dental school), there exist many fulfilling and in-demand careers that can be pursued directly after graduating. Chemical professionals can be categorized into five main fields: industry, academia, government, non-profit, and entrepreneurship.